Growing up near an Air Force base inspired one Reserve citizen airman to fly, and to continue to support his local high school. A graduate from Bethel High School, located in Spanaway, Staff Sgt. Zack Epperson, 313th Airlift Squadron loadmaster, volunteers at his former JROTC unit while serving in the Air Force Reserves. Initially starting out attending Washington State University, Epperson wasn't sure which ROTC service branch to join. "I knew I wanted to fly, but I didn't know who I wanted to fly for," he said. At one ROTC detachment, he describes the somber mood. "No one looked like they were having a good day and then I went over to the Air Force -- they welcomed me," he said. Unfortunately, Epperson had to take a different direction with his studies as his financial situation changed. Epperson explained, "I still wanted to fly, and my former instructor at JROTC in Bethel was a former loadmaster, so I knew about this job. Senior Master Sgt. (retired) Stephen J. Tkach III, Bethel High School JROTC instructor, describes Epperson as a natural leader. "During his time at Bethel, he filled many leadership roles including cadet command chief master sergeant and cadet squadron vice commander," he said. "In addition to his cadet squadron jobs, he led our Armed Drill team to several top three finishes as team commander." Enlisting with the 446th Airlift Wing 2014, Epperson is back in school studying psychology and plans to apply for a psychology program at WSU. 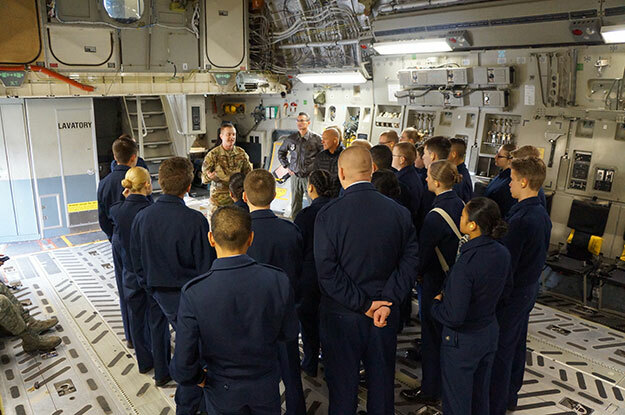 When not flying missions or studying for his degree, Epperson helped organize a way to show 25 Bethel High School JROTC cadets what it's like to fly on a C-17 Globemaster III in a recent orientation flight. "The cadets had a blast," he said. "During the flight, we cycled each of them up to the cockpit for orientations and we performed a combat offload after returning from the two-hour local flight." While becoming a loadmaster and flying are Epperson's career aspirations, sharing his military drill team expertise during his off-duty time is his passion. Volunteering at the school on a weekly basis, Epperson lends a hand helping train the cadet drill teams. "Since graduation, Zack has returned as a field expert to our cadet drill teams. With his combined experience from JROTC and Air Force service, he brings invaluable knowledge, leadership, and motivation to our cadets that will pay dividends for years," said Tkach. There are many paths to serving in the military, and Epperson is one example of being able to do what you love as well as giving back to the JROTC community who helped mold him from a cadet into a leader in the Air Force Reserve.